WWF today launched an online petition calling on Mega First Corporation Berhad to suspend construction of the Don Sahong hydropower dam on the Mekong River that threatens the river’s critically endangered Irrawaddy dolphins with extinction. WWF’s research estimates that about 85 dolphins survive in a 190-km stretch of the Mekong River between Kratie province in Cambodia and the border with Laos. Construction of the dam on the mainstem of the Mekong River is scheduled to start later this year. The proposed site for the dam is right next to dolphins’ core habitat. The Dam will cause the disappearance of dolphins from Laos, and increase their risk of extinction from the Mekong. The dam builders plan to use explosives to excavate millions of tonnes of rock, creating strong sound waves that could potentially kill the dolphins, which have highly sensitive hearing structures. Increased boat traffic, changes in water quality and habitat destruction pose other major risks to their survival. “The dam’s impacts on the dolphins probably cannot be mitigated, and certainly not through the limited and vague plans outlined in the project’s environmental impact assessment,” said Mr Gerry Ryan, author of a scientific review of potential impacts of the Don Sahong Hydropower Project titled ‘The Don Sahong Dam and the Mekong Dolphin’. “The Directors of Mega First have a choice – to side with the great river and its people, and find a sustainable path, or to continue with this flawed project and precipitate the extinction of the Mekong’s dolphins,” Mr Ryan added. Earlier this year, WWF’s analysis revealed that the Environmental Impact Assessment (EIA) conducted by Mega First uses flawed and incomplete research, putting at risk the world's most productive inland fisheries, and the livelihoods of 60 million people living in the Lower Mekong Basin. Despite calls by the Cambodian Government, non-governmental organisations, civil society groups and local communities along the Mekong River for in-depth trans-boundary impact assessments; Mega First has decided to forge ahead with the project. 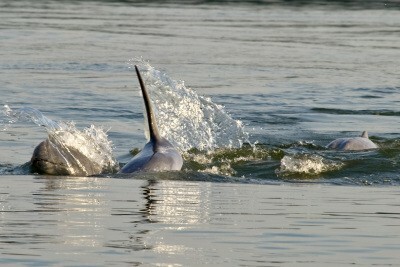 Mekong dolphins have great cultural significance to local communities and bring tangible livelihood benefits. Dolphin-watching tours are a major contributor to growth, bringing in much needed income to local communities. “It is the responsibility of Mega First to ensure thorough, objective and scientifically rigorous methods so that this project will avoid all impacts on dolphins and the Mekong River’s fisheries,” said Mr Marc Goichot, Manager of Sustainable Hydropower & River Basin Management with WWF-Greater Mekong. Better alternatives to the Don Sahong dam exist. The Thakho Project, which would generate approximately the same amount of electricity as the Don Sahong dam at a lower cost and with far less impact, does not involve building a barrier across any of the channels of the Mekong mainstream. Unfortunately, the Thakho project cannot move ahead if the Don Sahong dam proceeds as they compete for the same water. WWF calls for a suspension of the Don Sahong Dam pending completion of independent, comprehensive and scientific trans-boundary studies, including transparent consultation with governments, civil society and communities that would be affected by the proposed dam, and the investigation of more sustainable options.